Rackaphile 2-Tier Wire Under-Sink Rack is such a great use of vertical space under cabinets or in closets. With two deep baskets, our rack adds additional storage space for you and alleviate under the sink clutter. It comes with an instruction sheet and involves snapping the clips on the upright rods to hold the shelf and the basket runners at whatever height you require. No tool required design and smooth sliding runners for hassle-free use. It is the best choice for you to place on your countertop or under the sink. All dimensions are manually measured with a possible deviation of 0.4-1.2 in. Accessible from Both Sides: Rackaphile rack is perfect designed for narrow space when access is required from both sides of unit. 2 pairs of stoppers prevent the baskets fully sliding down; baskets can be completely removed if required by taking the stoppers away. 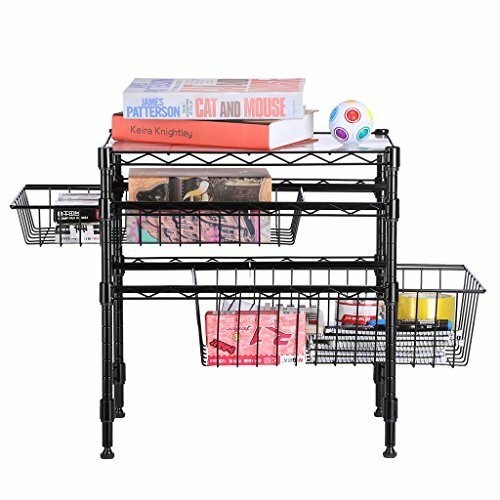 Adjustable Height: Wire shelves adjust up or down in 1 inch increments to fit different heights you require; comes with 4 adjustable leveling feet to keep the rack in place and allow you to balance and stabilize it, even on uneven surface. Sturdy Materials: The all-metal frame turns it effortlessly resistant and less likely to bend or wobble during shipping and daily use; it holds up to 44 lbs of evenly distributed weight; sleek powder-coated finish protects the rack from water/rust. Easy Assembly: No tools required; snap clips onto the posts at the desired height and then slide shelf/baskets down the posts through the corners until they rest firmly on the clips; an instruction sheet is included in the package for your reference. Perfect for Narrow Vertical Space: With under sink cabinet, Rackaphile rack is great for kitchen, bathroom, office and storage room organization. Gain more space in the cabinet, pantry room or even open space. If you have any questions about this product by Rackaphile, contact us by completing and submitting the form below. If you are looking for a specif part number, please include it with your message.